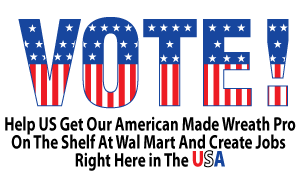 We Need Your Help - Vote For American Jobs! We need your help! Please follow this link and vote for Wreath Pro in Wal Mart's Get On The Shelf contest. Since day one our goal has been to make and package Wreath Pro right here in our own home town and try our very best to create some badly needed jobs in our community. It's been challenging but our manufacturing facilities are up and running and we are producing Wreath Pro right here in PA.
We just learned that Wreath Pro made it to the second stage of the contest and now consumers' votes will decide the winners. Winning would translate into higher production, lower prices and more jobs! Please help us by voting for Wreath Pro everyday between now and Sept. 2, 2013 and please get as many of your friends and their friends to do the same.